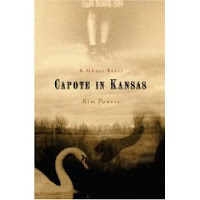 Capote in Kansas is a different kind of book for a plethora of reasons. Kim Powers daringly uses two famous personalities and explores their shattered friendship. During the last days of Capote's life, Powers imagines a final correspondence between Truman Capote and Harper (Nelle) Lee. Capote's mind is pickled by drugs and alcohol. He makes a frantic phone call to his former best friend. He's been seeing ghosts, the ghosts of the Clutters. Capote immortalized their brutal deaths in his book In Cold Blood. He believes they've come to haunt him for his part in their unwanted fame. For Lee, this phone call brings back unpleasant memories and causes her to brood over their lost friendship. Years ago, she helped Capote research In Cold Blood, while trying to get The Book (To Kill a Mockingbird) published. Never one to share the spotlight, Capote grew resentful of the public's fascination with Lee once The Book starts getting attention. He whispers a rumour which ends a lifelong friendship. While subtitled as 'A Ghost Story', the ghosts (and it's questionable if they really are ghosts) are a very small part of the book. It's more a ponderous tale of what really happened between Capote and Lee. At first, I had a bit of trouble reviewing Capote in Kansas. I felt rather squeamish about Lee as a character since she is such an icon and still living. However, after interviewing Kim Powers (and how often can you do that?!! ), I understand what he was trying to accomplish. What I know about Capote could fill a thimble, but from what I understand now, he was a lot like the character in the book. He seems to have loved shocking people and pushing their buttons. It just goes to show that behind all the pretty words is a real person with real frailties. If you've ever wondered about Capote and Lee, this is the book for you. My thanks to TLC Book Tours for sending me a copy of Capote in Kansas and letting me be a part of this book tour. Please visit my blog tomorrow. I'll have my very interesting interview with Kim Powers. I think you'll enjoy it. I really have to read this book. I look forward to the interview! Yay! Great review, and I can't wait to read your Q&A. I am so looking forwad to reading this book! Thanks for an awesome review and interview. Teddy trying to catch up on blog reading. Great review! I really enjoyed this book. I knew next to nothing about Capote and Lee when I started reading, but I knew Lee was still alive, and I wondered about her inclusion in a fiction novel. However, Powers does an excellent job!